Gasmet DX4040, the portable gas analyzer, is the most compact ambient air FTIR analyzer in the world. The key features of the Gasmet DX4040 include a high sensitivity sample cell for lowest possible detection limits, true multicomponent capability and a built-in-pump, which means that there is no need to use a separate sampling system. 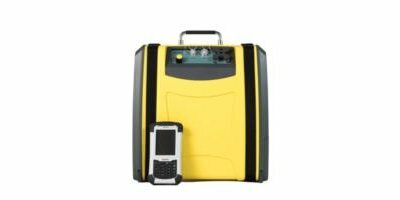 The portable gas analyzer is also lightweight and battery powered providing unparalleled portability for such a powerful analyzer. The DX4040 can be used to measure up to 50 components simultaneously and addition of new measurement parameters is easy, without any need of hardware changes. The sample cell is at ambient temperature providing low energy consumption for maximum battery life while also minimizing warm up time of the analyzer. The analyzer can be operated by through Calcmet lite on a IP67 rated PDA (Personal digital assistant) with Bluetooth connection for maximum portability and ease of use. In challenging applications, the DX4040 can be operated with Calcmet Pro on a laptop computer providing the capability to analyze complex samples and identify unexpected compounds on the field. Typical modern printing processes utilize solvent-based dyes. The evaporation of the dye solvents into the ambient air during the printing process may expose the workers to various chemicals. Depending on the type of solvents in case, the solvents have different long term exposure limits, which should be obeyed. Component specific measurements are necessary to protect the workers from exposure while avoiding unnecessary interruptions to the printing process from false alarms. Accidents involving chemicals and other hazardous materials require fast and accurate gas measurements as part of the first response. The Gasmet™ DX4040 portable FTIR Gas Analyzer provides reliable identification and concentration measurements of hazardous gases in 60 seconds or less. Jamie Hoyle from South Devon Healthcare's Pharmacy Manufacturing Unit (PMU) at Torbay Hospital explains how a Gasmet portable FTIR multigas analyser is employed for the measurement of a range of anaesthetic gases in locations such as theatres, maternity and day surgery. This helps to ensure the safety of staff and patients in these areas. The instrument was supplied by Quantitech Ltd, which also provided specific calibrations and training. Dr Andrew Hobson of Quantitech demonstrates the lightweight, battery-operated and portable Gasmet DX4030 FTIR gas analyser for ambient air analysis. Its designed for applications where a number of compounds need to be accurately monitored in ambient air. Examples include leakage detection and various industrial hygiene applications. The Gasmet DX4030 is a lightweight FTIR gas analyzer for ambient air analysis. It's designed for applications where a number of compounds need to be accurately monitored in ambient air. Examples include leakage detection and various industrial hygiene applications. It's also well suited for first response / HAZMAT type applications, thanks to its lightweight construction and fast response time. This is only a demonstration of Gasmet Gas Analyzer in soil emission measurement (e.g. duct tape was used only for demonstration purposes). No reviews were found for Gasmet - Model DX4040 - Portable Ambient Air Analyzer. Be the first to review!